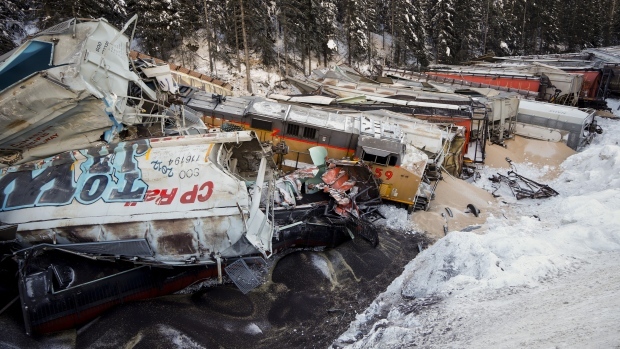 The deadly train derailment in the Rocky Mountains is raising questions about the Alberta government’s plan to ramp up rail shipments of crude oil. Conductor Dylan Paradis, engineer Andrew Dockrell and trainee Daniel Waldenberger-Bulmer were killed Monday when their train derailed near Field, B.C. The train had been parked on a grade for two hours with its air brakes in place. No handbrakes had been applied. Federal rules mandate that handbrakes must be used to secure any unattended train. Transportation Safety Board investigators say their preliminary finding is that the train suffered a “loss of control” and started rolling away under its own power. A runaway train was also behind the 2013 derailment which killed 47 people in Lac-Megantic, Que. Unlike the train that derailed in B.C. this week, the one that went off the track in Lac-Megantic was carrying crude oil. Environmental groups are pointing to both derailments as signs of the risks of rail transportation, particularly when it comes to moving dangerous goods. “No community should have to lie awake at night wondering if this kind of disaster is what they’re going to wake up to,” Greenpeace Canada spokesperson Mike Hudema told CTV Calgary Wednesday. The Alberta government announced last November that it intended to purchase up to 7,000 rail cars to transport crude oil out of the province. Hudema says Greenpeace has “significant concerns” about this plan. “When a situation already isn’t safe, we shouldn’t be increasing the risk – and that’s exactly what the Alberta government’s plan is doing,” he said. Alberta Energy Minister Marg McCuaig-Boyd said in a statement to CTV Calgary that safety is the government’s top priority when it comes to transporting oil. “We’re working with industry to ensure the highest standards while we address serious bottlenecks in getting Alberta’s oil to market,” she said. CORRECTION: An earlier version of this story said that federal rules mandate that handbrakes must be used to secure any train parked for more than two hours. This is incorrect. Federal rules mandate that handbrakes must be used to secure any unattended train.